The Dolphin Browser got a major update today, bringing gesture commands to the popular third-party browser. Users of the Dolphin Browser can now draw symbols on their screen to navigate around the web. For instance you could draw an "F" and have your phone load Facebook, or draw a circle to reload a page. Much like Firefox, the Dolphin Browser will also support add-ons such as ad blockers or Google Translate. You can also customize the browser with different themes in case you get bored of the default look. But, probably the coolest feature that the new update brings is the Dolphin Webzine. 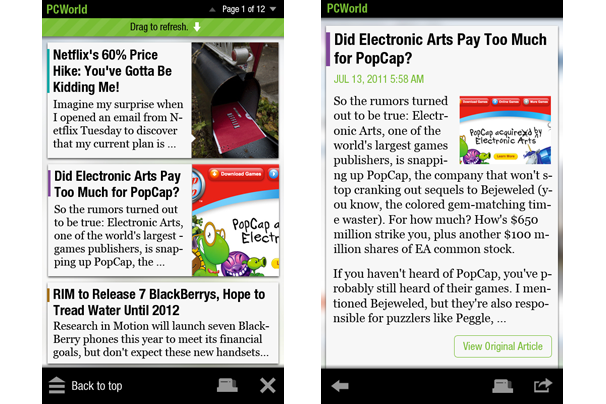 If you've ever used the Google Reader app for Android, you will feel right at home with the Dolphin Webzine. You can create "webzines" using a website's RSS feed. Dolphin Webzine will simplify the website down so that it is easier to read on mobile devices. It's a much cleaner way of staying up to date with your favorite websites, rather than fussing about with a mobile webpage (which are often not very well done). The Dolphin Browser is free in the Android Market and makes a pretty good alternative to the stock Android Browser. It's worth giving it a try, if only for the ability to make "webzines" out of your favorite websites.